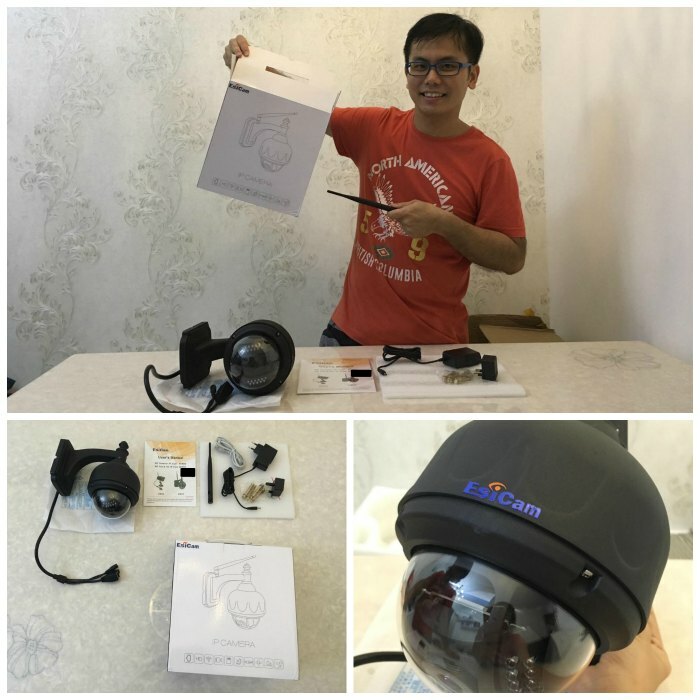 iSmartLife Mall Web Star’s sharing: Why I install a surveillance camera at home? #GerzShares the EsiCam HN11 720P Waterproof WIFI Speed Dome Surveillance Camera Outdoor PT Wireless IP Camera! This blog post is proudly sponsored by ISmartLife Mall – One Stop Mall for Smart Hardware. Why install CCTV? Isn’t Singapore very safe? Is there really a need? So nowadays you think Singapore is very safe? 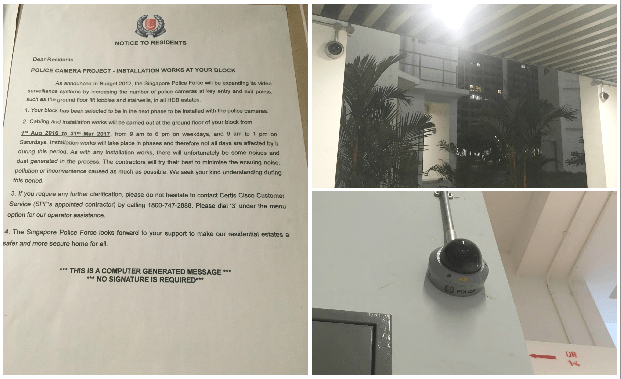 Why install CCTV? Is there really a need? 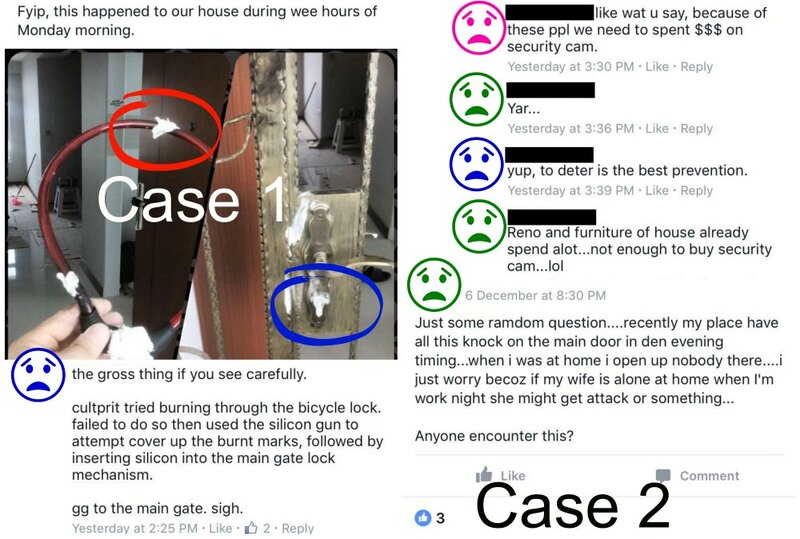 So nowadays you think Singapore is very safe? If you do read the news, you will know is not really that safe in my opinion. 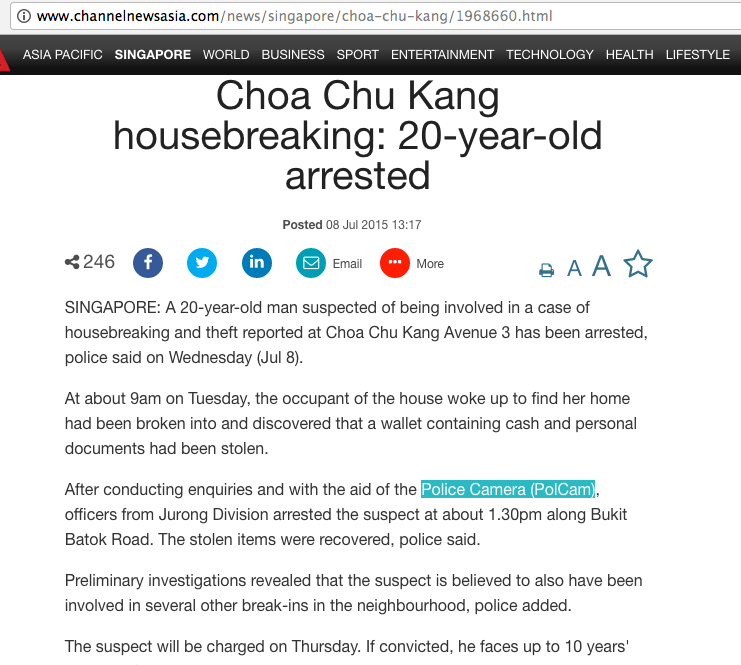 You can google, Singapore house break-in for yourself it’s common, it can happen to anyone so don’t take safety for granted! My house was break-in before when I was 9 years old, our window along the corridor was pry open to steal our valuables near the window. It’s not exactly a break-in break-in but still the offender was not caught…… If I had install CCTV then this won’t happen..
Reason 1: It will deter the offender from committing this crime. Reason 2: We won’t lose our valuables. Reason 3: We can bring him to justice. But reason number 1 is the best… It deters.. When I have CCTV, he wont commit the crime, if he did not commit, he wont be caught and I help someone by not letting him be guilty / go to jail. In other words you will help a lost sheep by not letting him do the wrong thing. 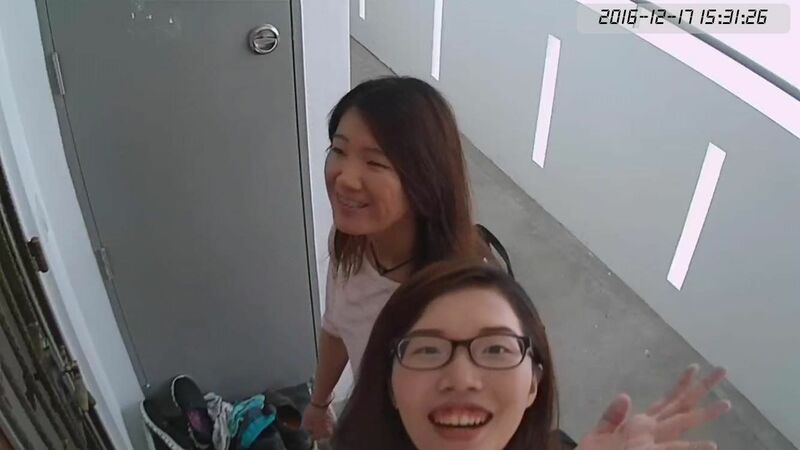 Of course even you have CCTV, you also must not show off your valuables like by putting your 1-thousand dollars diamond ring or Limited Edition Nike Shoes outside your house and depend on the CCTV. 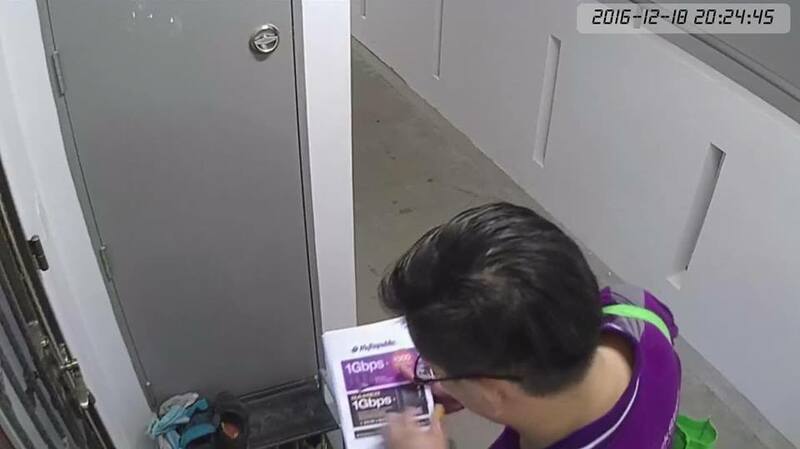 I never place my Limited Edition Asics running shoes outside the house, not that I don’t trust my CCTV, I fully trust it because you will be WOW-ed at it’s function but I can’t afford to lose it or even why must I 引人犯罪?! So silly meh? 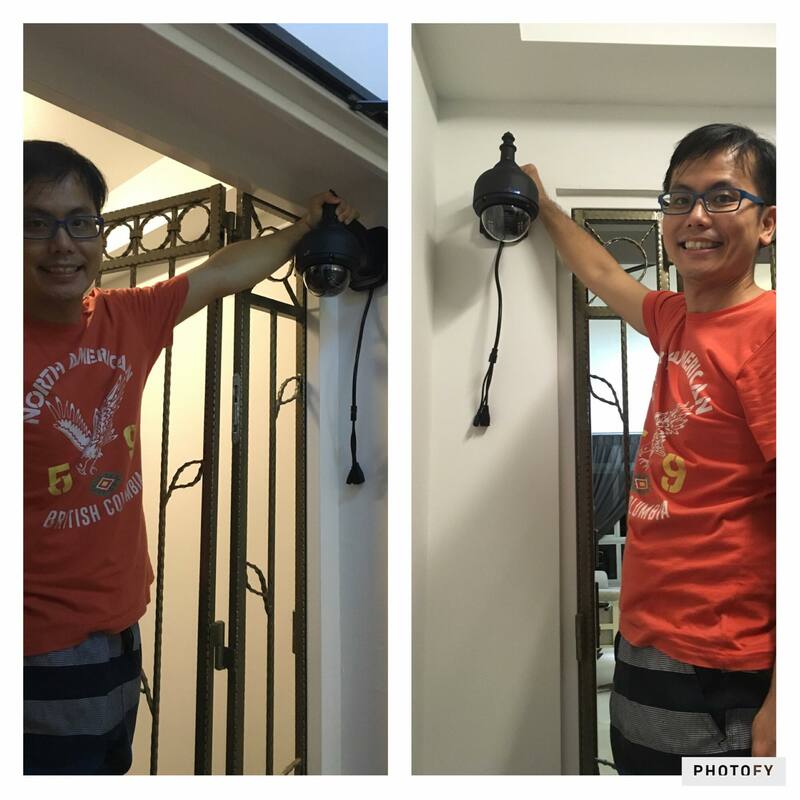 My CCTV function is more to DETER than to catch… Also to catch if you disturb my house… Or my neighbour’s house. See I am a good neighbour! There is also another reason why I need CCTV. As you know, we as bloggers often receive packages from unknown!! I swear it’s unknown.. With CCTV I will know who left it behind or sometimes like if I am not home, sponsors send items to me I can ask them leave it outside at least for 10mins or so before I reach home otherwise they make a waste trip. Some sponsored items are super big!! Like this CCTV!! And those deliver are not postman they are the owner themselves! I got 1 million and 1 reason to justify why I need a CCTV and convince Casper to install one!!! And if I don’t have a reason then why am I writing this post, right? Even our neighbourhood Police also install CCTV and it helps them to crack numerous cases! So there is a need for camera!!! I am sad to say, this is in Singapore and it’s happening in my estate… Really hate to say this but well, it really happens. I did not share on Facebook but I shared it with my personal friends aka BFF. About a month ago, my house was almost broken-in. My own negligence actually, I did not lock my Main Door but I did lock my Main Gate. I was having lunch at the dining area and suddenly someone (a male) pushed open my door. I scream at him. He ran off via the lift but I saw is a man in black t-shirt. I dare not go out and chase him in fear what if he is armed? Although I learnt taekwondo but my mother always tell me….. I was thinking I should chase after him but too bad I was too slow to unlock the main gate, shocked and I thought if I had a CCTV, he won’t have pushed the door or won’t even step near my house. But of course from now on, we increase security of my house too by remembering to lock all my doors and added Digital Lock to enhance safety features. After visiting my good friend Felicia house (also in my estate) for makeup, I realised she too has CCTV and a walk around our estate, quite a few units have CCTV too and Police have been installing not 1 but 2 CCTV(s) at the lift lobby and even at carparks! You know la… Police don’t anyhow waste money install stuff one.. If they do something about it.. It means probably something happened! Right now, our estate frequently has Police doing patrol!! Woohoo!! Well let’s not speculate whether my report or my neighbour’s police report “activated” the police patrols but thanks Mr Policeman & Miss Policewoman for keeping our estate safe and sound! At the same time I shared my incident to my friend Steven, and he helped me to liaise with iSmartlife Mall. I am very happy that they decided to engaged us to promote EsiCam Product!! Lucky me, no need to spend a single cent and I got a CCTV. So I picked HN11 out of all the other camera out there. But first let’s do unboxing!!! I love unboxing presents! Such a huge package. I did not expect it to be so huge! It’s huge, he said.. He call this “dua leng gong” (hokkien) it means Big and Huge! He said ours are even bigger than those at the lift lobby. Is it? I don’t think so! But it’s quite heavy to lift it. 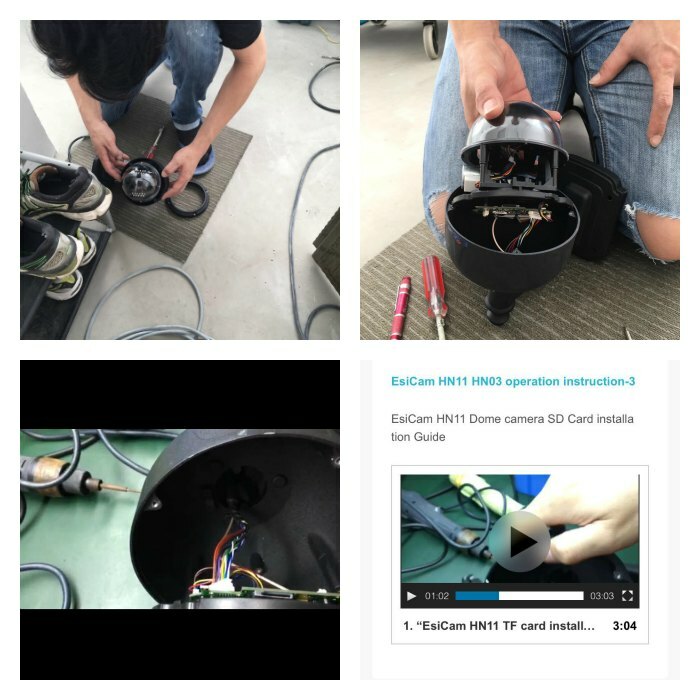 Basically the EsiCam HN11 Camera, Lan Cable, Antenna, Power Adapter, Huge Screw and a Manual on how to connect the camera. 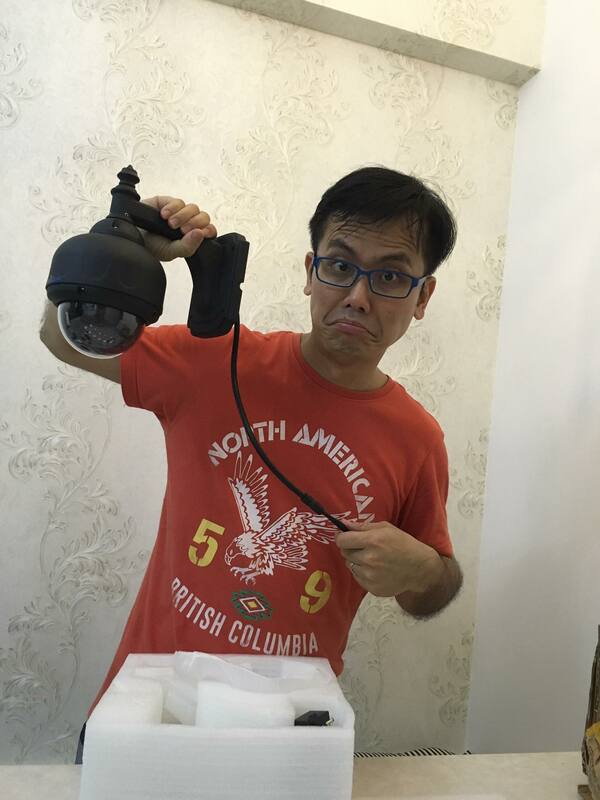 As we all know there are tons of cameras out there and why EsiCam HN11? My reasons are listed below. Do note: The reasons given below were tried, tested and proven based on the best of my abilities. It’s not like I just anyhow quote from the website and never try it out. I did try it and test it for this review. So this review is very reliable and authenticity level is 100%!!!! I will show proof with screenshot! Ger’z Shares is here to share good products so if it’s not good I won’t share. If it’s good but needs improvement I will also suggest it out. I shall now collate the good functions of this camera into 7 points. Option Left: In between the Gate and Main Door. Option Right: Beside the Main Gate. I picked right as I said, my purpose is to deter and not to film anyone on purpose. Hence I need it to be obvious to scare people with ill-intention off. 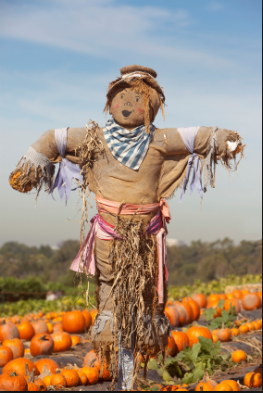 I want it to be a SCARECROW EFFECT! Next is installing SD Card. This is performed with the help of a professional, my favourite electrician Darren! First is making a hole into the wall so the wires can enter my electric box to get power supply. Second is to secure the camera up in a ideal position. This can be done easily with a drill but we prefer to leave it to Darren. Reason being is that we prefer the wires to be boxed up nicely using white cable cover or white wire track so it looks neat and tidy and Darren helps me to cover the drilling holes with white silicon and white paint. It’s a very good job he have done for me. I believe Casper can do it too but definitely not as nice as what Darren can do. 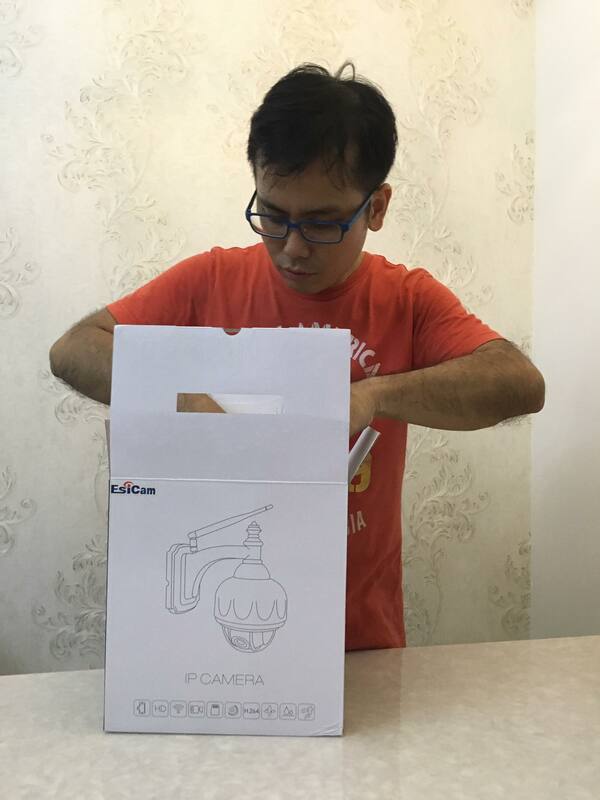 This is the APP setup & installation of camera. It’s very easy and I settle it in less than 5 minutes. Just follow the instruction and it will add your camera automatically as long as it’s connected correctly. This is the first picture taken on my camera after being connected. Told ya, Darren is very neat and tidy even his assistant too. They helped to sweep my floor and also sweep my corridor! Yay! No need to sweep today! HD Camera of 1MP, High clarity (720p 1280×720) live view & record. This is a “live” screenshot while we are posing. This is a screenshot of the playback! As you can see, it’s very clear!!! Not as if after recording it will be less clear or blur. 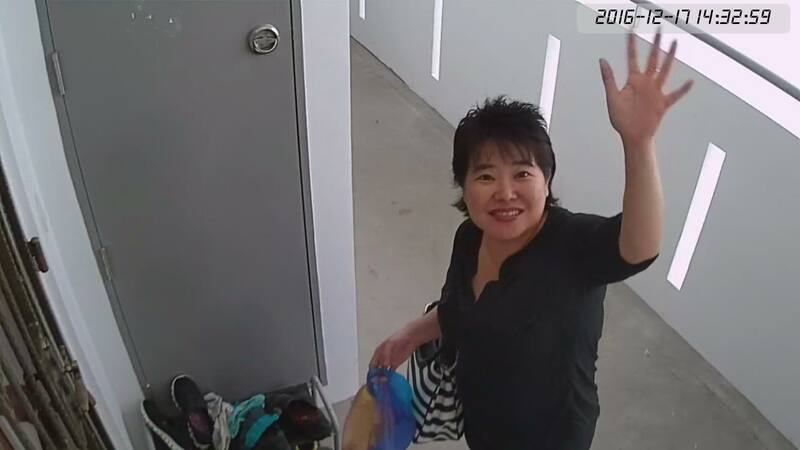 My mum looks so happy when she saw the CCTV because she know her daughter house will be very safe! 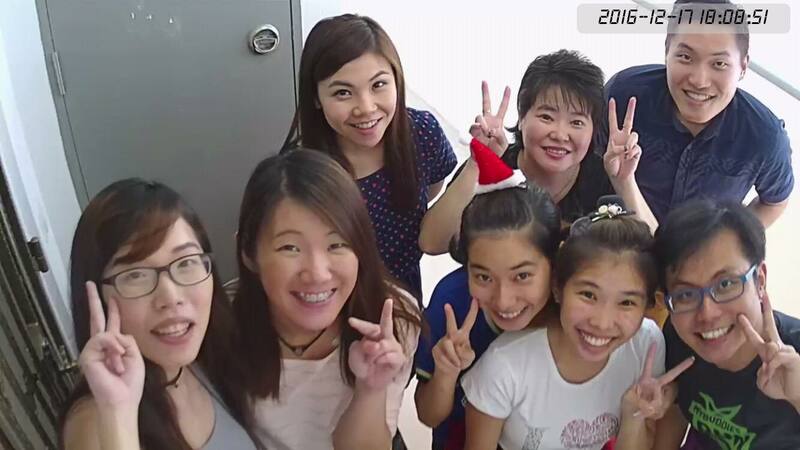 Next day BFF Suxian came and filmed our gathering! We had a hard time saying goodbye! Because we are not sure when we will meet again because she is staying in Malaysia right now. Hopefully we can meet up real soon! Food for our gathering “Big Santa Box” by Pizza Hut.. You can see the BIG SANTA BOX clearly right? This Theresa so funny! 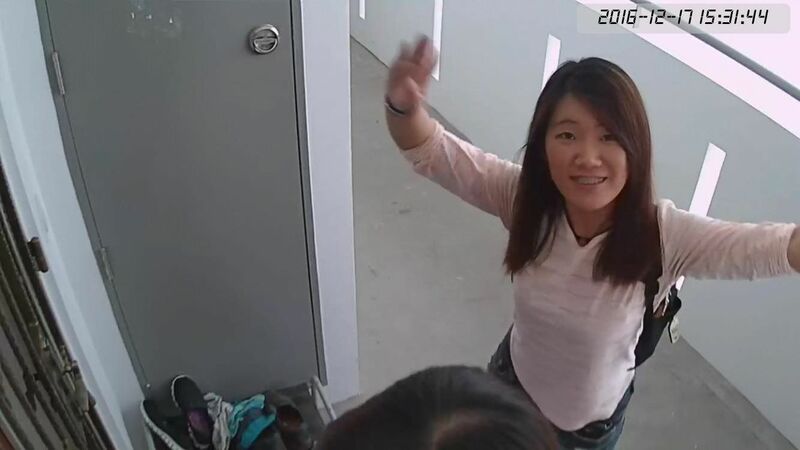 Kept waving to the camera because I am not at home but watching the CCTV. So she said Hi! to me over the camera. Then I whatsapp her the photo! Kelin too! My sisters are so funny!! I feel very safe about file storage. There is 4 ways of storing the recordings. You can save directly to PC, directly to “cloud”, save it to your iPhone, lastly…. SD Card (Memory Card) they can support up to 64GB which can hold up to about 11 days of recordings. However… We installed a 32GB card on 14-Dec-2016 and after 6.5days of recording on 20-Dec-2016 11:30am. 6.8GB / 30GB as of now. We put it on a 24hrs recording mode on high quality. Hence 6 days about 6GB, 1 day about 1GB. So I assume it can last for 30 days before the data starts to get over-write. The SD Card is very hard to insert vice-versa, very hard to be removed. Even removed, there is “cloud” and iPhone and PC. I mean if you don’t want to install SD card, you can save it directly to your PC or “cloud” or iPhone, totally no issues. #4 No Blind Spot with 355° Panning & 90º Tilting with Preset Position You are able to set 5 different Preset camera Position at ease using just iPhone App or up to 16 position using PC. You see, I have only used 4 and it’s sufficient. Look at the timestamp @ 2024hrs, a salesman promoting internet services came. And look… You can see his brochure / flyer information clearly right? That’s it… I guess I no need to type anything because this picture proof that the night vision is nothing BUT…. AWESOME!!!!! Let’s do a testing I made a snap on my finger @ 0015hrs. 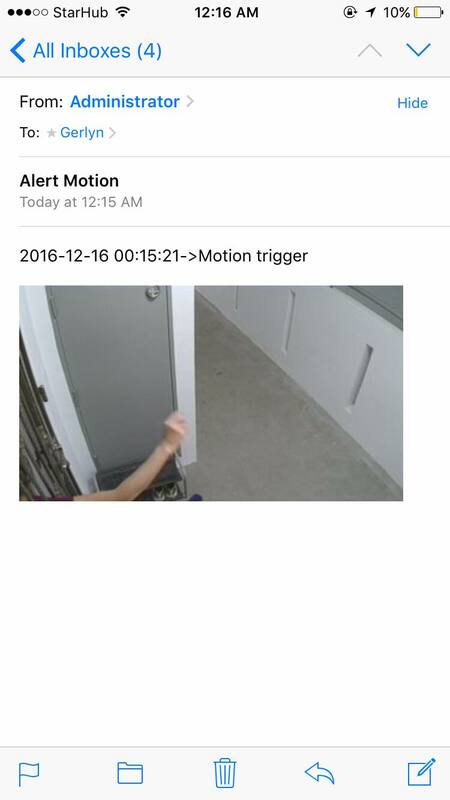 Next moment, 12.15am (0015hrs) PUSH Notification came from the APP. Not only that, EMAIL notification came too!!! You can sent to 4 different email addresses! It’s cool right? Now… What do you say about my CCTV? The ability to update firmware is very important. It means..
#1 EsiCam is constantly upgrading and improving it’s CCTV. #2 You will always use the latest update technology and software. HN11 also claim that they are Waterproof and suitable for Outdoor environment, can withstand temperature from -10℃ to 50℃. This one I don’t know how to try and test to proof they are waterproof a not but it did experience heavy downpour as my house is a corner unit hence rain can’t exactly hit the CCTV so I will say it’s SPLASHproof for sure. Waterproof I am not very sure. Suitable for outdoor environment I think Singapore can’t really test this out, unless when one day Singapore start snowing, I will update you again! HAHAHAHA! Remember to ask for DISCOUNT!!!! If you are interested to make a purchase, please email sales1@iSmartlifeMall.com with my name “Gerlyn” for a special discount code.